DAVID CUTCLIFFE: We obviously realize how difficult a task it is to go to Miami, and not only to play well, but to win. Extremely athletic team. A team that plays really well at home. We've had good preparation. I think our minds are in the right place. We're trying to overcome getting -- beat ourselves, and a huge challenge and one that we need to challenge ourselves to be able to be successful. Q. A little off-the-wall question for you. Who was your athletic idol growing up and why? DAVID CUTCLIFFE: Mickey Mantle because I saw the Yankees more than anyone else. They certainly were on TV, baseball Game of the Week. I could go out and simulate being Mickey Mantle by myself, throwing the ball up and swinging in the air, and I was a switch hitter, so that helped. Q. Did you wear No. 7? DAVID CUTCLIFFE: Absolutely. The other one was Joe Namath, quarterback, No. 12. I had many of them. Listen, it changed, you know. Q. From season to season? DAVID CUTCLIFFE: Well, yeah, season to season. You know, the basketball was a little different, a little more removed. There was one game a week. Bill Russell -- I worked on my left-handed hook shot because of him. You're bringing up good memories, I can tell you that. Q. Miami's defense seems like they are growing every year into an elite defense. What do you have to do to not put play that fourth ball to those guys and put that turnover chain thing back on? DAVID CUTCLIFFE: They do a lot of things that create turnovers. First of all, they lead the country in tackles for losses, and that's a big part of creating turnovers, creating bad down and distance. You can't be desperate. You have to be smart and patient. You can't play afraid or cautious, but you have to play smart to play a team like that -- we call them havoc plays, and their defense, as we view, it leads their country far and away in havoc plays. Q. How do you prepare for two quarterbacks or whatever? How do you prepare for that? DAVID CUTCLIFFE: They really don't change their offense. I think one quarterback may run more than the other, but they have so many weapons that surround the quarterback position that you'd better focus on that. So that's not as problematic as you might think. Q. Covered your game in Atlanta and you guys looked so good. I thought you had a pretty good shot at winning the division. Would it be fair to say you're kind of surprised to be where you are now, two weeks later? DAVID CUTCLIFFE: Yeah, I mean, there's no question that this team is not the same team. We have been challenged. You hesitate as a coach to ever say these things, but we've been as many as 12 starters down and it just continues to take its toll. That's something that we are hopefully turning the corner. We still have a lot of people not making the trip to South Florida, but we also know that this team is the deepest team we've had. So my job is to get our young people playing better, and that's the biggest issue that we have faced are inconsistencies. You saw us in Atlanta, we were able to create some turnovers. In the three games we have lost, we have not created a single turnover. We've lost the turnover margin 4-0 in those three games, and we're playing a team that thrives on it. You know, it's not a secret. If you're going to win, you've got to do the things that winning teams do. Our young people have got to not be young people right now. We've got a lot of them playing that we didn't think we would be playing with, but we are playing with them. So as I said, my job is to have them ready. Q. Do you have a guess at who the top team in the league is, or in the division as of this week? DAVID CUTCLIFFE: Obviously right now Clemson is playing at an extremely high level. They are left on our schedule. But the Coastal Division, it's just very difficult to say. The team we're playing this week is extremely talented. But Virginia has played really well. Virginia has played very opportunistic and solid. But I wouldn't call a winner right now. It's a horse race that you can't call. Too close to call. Q. Can you put your finger on what's made the division so balanced? 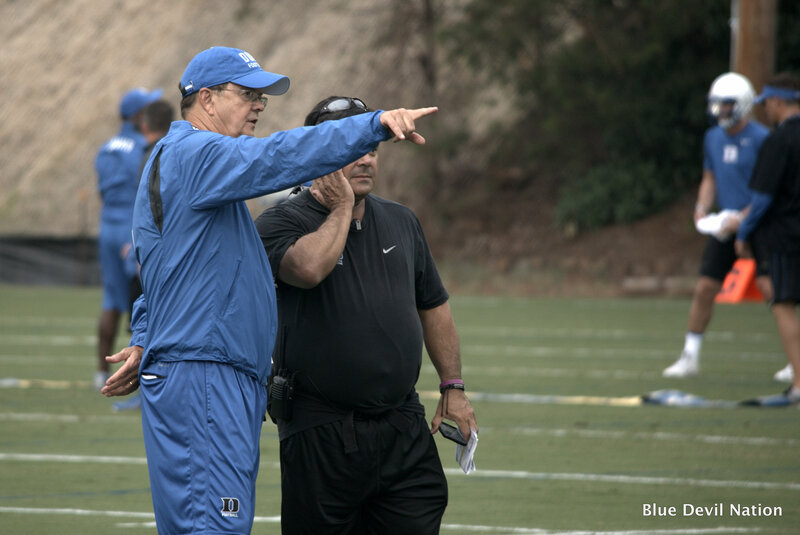 DAVID CUTCLIFFE: I think the coaching has just continued. Paul Johnson and I have been in this league the longest, and we know the kind of job that he does. Georgia Tech has been really impressive here of late and just really, year after year. Then you start looking at what Justin Fuente has done to follow up a legend in Frank Beamer. And then Bronco Mendenhall is just an outstanding coach and got Virginia playing well. Mark Richt is at Miami and got Miami playing well. Pat Narduzzi at Pitt; you want to talk about physical football, and Pitt football teams have been that way for as long as I can remember. Larry Fedora at North Carolina can score on anybody. They have just hit over the last two years a rash of injuries and circumstances. I think I've covered the Coastal there. I just have great respect for the coaches, both in the Atlantic and the coastal, and I think our league is terrific right now. Like I said earlier and somebody else asked a question, it's no secret. You have to do the things -- if you're normal, if you're not just overly talented compared to everyone else, you've got to do the things that win football games, and that's no secret. There are four or five things that a team has to do and embrace together to be a winner, and we haven't done it as well as we needed in the three losses. It was very disheartening in Pitt that we kept giving up when we'd get two or three scores up. That's my job is to get us over that hump and we're going to find a way to do it. DAVID CUTCLIFFE: Obviously this is our biggest test to date and the best team we've played, a team we're very familiar with, a program we're very familiar with. I don't think there's anybody that you can respect more than the way they do things, have done things. I think Justin Fuente has just been tremendous there. Bud Foster is an icon in the business. This is the thing -- the benchmark. This is where you find out what kind of program you've got. Our guys have practiced hard. We'd better, because we're going to be in for a big challenge, obviously, this Saturday night. Q. Bud Foster and obviously the stability that he's brought to the defensive coordinator's role, you had some stability there with Coach Knowles. How would you evaluate how you guys have transitioned with Ben and Matt in those roles this season? 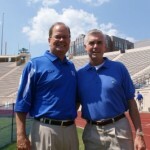 DAVID CUTCLIFFE: Well, it's a unique circumstance, and I realized that as I did an evaluation -- Jim Knowles and I talked a lot about this when Jim -- when he was offered the job at Oklahoma State, he and I were on the road together recruiting. You know, I did a lot of thinking. But the reason that we went co-defensive coordinators is the quality of the people that we have in Ben and Matt and the quality of the rest of the staff, Derek Jones and Lanier Goethie. So we're at a point where we're still growing in that regard, but we clearly defined their roles. It is a transition, but our players were very familiar with both coaches. We have had a lot of stability in this program, so that helps a great deal. We certainly wouldn't be the same without Jim Knowles. There's no question about that. But we have continued to try every year to grow and build on what we're doing, and I think Ben Albert and Matt Guerrieri have done a great job of doing that. Q. Is one of the biggest challenges they and you have faced is the injury situation in the secondary, just having to plug different guys in and switch roles and such? DAVID CUTCLIFFE: Yeah, it was the most unique thing. It started, obviously, at Northwestern, and then it escalated at Baylor. It's been unique. It's a great tribute to our assistant coaches. They've recruited well. We do have some really good young players in the secondary, and they're performing at a high level. They hopefully have -- when you come in here, you develop great practice habits, and so if it does happen, that makes it a little easier to adjust. But very proud of our -- not only our staff in that regard but proud of our players, you know, just managing adversity. And there will be more to come, not only here playing football but in life. I am proud of them. We've just got to continue along that path. Q. I'm writing a story about the nomadic lifestyle of assistant coaches, and wondering if there isn't a little bit of a trend toward giving a little more security to assistants by longer contracts, and a second part of the question, do you think there's -- have you ever seen anything really unusual happen within the style of jumping from one program to another? DAVID CUTCLIFFE: Yeah, I think it's been a long-standing trend for certain people. When I was a younger assistant, a young assistant at the University of Tennessee, we were working without contracts, period, not one year. Just no contract. We had a pretty revolving door. I was there for 17 years, and the number of different assistant coaches that I worked with was in the upper 30s. I never -- I think that's sometimes personal preference. I think there are a lot of people -- I think it's problematic to people because I do think, and I tell young coaches this all the time, be where your feet are. I've known a lot of people in the industry that were always trying to get the next job, spending more time trying to get the next job than doing a great job with the one they've got. I do believe that if you have assistant coaches that are committed to your program, they're doing what they should be doing, I think they should earn longer term contracts. Two- and three-year contracts are becoming more commonplace. Buyouts are now more commonplace for assistant coaches because with that security goes a price with it, and if the university is going to commit to that, most universities now are going to require some form of buyout where people don't just jump. So it's an interesting era in football. It's changed quite a bit since I got into it. 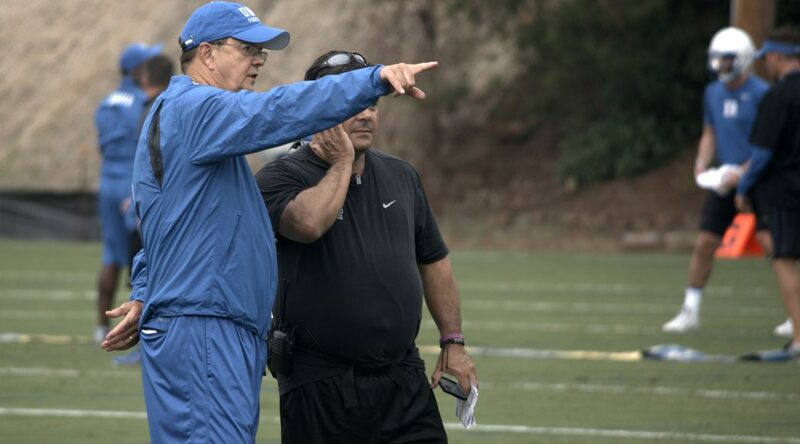 DAVID CUTCLIFFE: Well, I mean, I can tell you this: It was interesting, guys I worked with that came from California that sold houses were shocked what they could buy out east. They were in mansions in my mind. That certainly happened. But I know Derek Jones on our staff, between being a graduate assistant for us at Ole Miss and then kind of jumping around, he had a couple of homes and was -- you're trying to lease homes and you're not there, and it certainly can end up being a nightmare. I've always -- I guess maybe I'm just old-fashioned, but I've always liked being in a place, particularly when our children were young, trying to raise our children in some form of normalcy. So it's an interesting study. I think that's a great idea to write an article about. Q. If you look at the way they struggled defensively in the secondary against Old Dominion, when you're looking at that, are you seeing schematic breakdowns, guys just getting beat, or what did you make of that? DAVID CUTCLIFFE: Well, I would say for the biggest part, it's an outlier, and that's taking nothing away from ODU. Good gracious, they made great plays and they were ready and well-coached. But everything just kind of fell right. I mean, literally just fell right. You hate to call anything luck, but it was like, okay, you play zone, they scrambled and then just found a way to make a gain to keep a drive alive. You play man, the ball just dropped down right in the exact right spot. I mean, it literally was like that. I've watched Virginia Tech defense for a long time now. It is storied, as we all know, its excellence in athletes, its excellence in coaching strategy and scheme. So it's just one game. Really, honestly, that's the honest answer I can give you. Q. As you watch them, No. 94, their defensive end, who they dismissed from the team, are there moments that you're prepping for a game and you see him and think, man, I'm glad he's not going to be somebody I have to deal with? DAVID CUTCLIFFE: Well, I've got too many -- there's 10 others, 11 others that you're worried about. I think he was a really fine player. I don't know the young man at all. But there's no question he was an outstanding football player. Q. I'm just wondering if there's maybe a right word or description to kind of nail down the energy or vibe amongst your guys just going into a national TV game? I'm sure they obviously know what's at stake, but if there's one thing you've taken away from their energy this week. DAVID CUTCLIFFE: Yeah, I think that's a really good point because I have watched it. I think our program has grown from different points where we had big games that you worried about getting too hyper, too into the moment as opposed to preparing for a ballgame. I think right now what I would say is focused. These kind of games should create focus, but that's what I've seen, and hopefully that carries over into Saturday night. DAVID CUTCLIFFE: I think it's been good for us, really a shorter August than maybe we're used to having in years past with 25 practices, but I think because of the opponent, the quality of Army, a team that won 10 games and it's no accident, and our players have been intense, they've worked hard at preparing well, I do believe they're ready to play. I know they're ready to play a game. They're tired of hitting each other. It's going to be difficult with the offense they run. They led the country a year ago in 3rd down conversions and 4th down. Got to get stops where we can, and then offensively we'd better be efficient when we have it. Q. 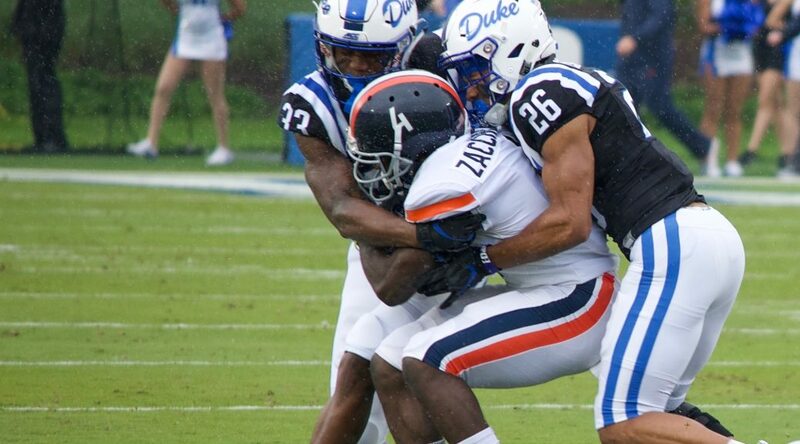 To speak on the wide receivers, Johnathan, T.J., Chris and company, just what you can say coming through fall camp with the weapons that are out there for Daniel Jones and what you're taking away from the wide receiver group? 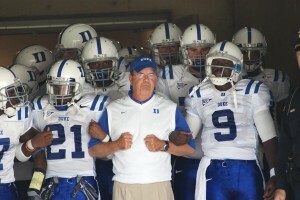 DAVID CUTCLIFFE: Well, I'll tell you, they're veteran. Obviously, you just mentioned three seniors, Aaron Young, a junior, is a big strong target who has had his best camp. Johnathan Lloyd has had probably the best camp of all of them. But T.J. coming back is the leading receiver in the ACC in the number of catches. It's just veteran people. What I like the most, Gerad Parker is a veteran coach, but they really set a tempo on the practice field, all of them. We've got some talented young people in Scott Bracey and got three talented young freshmen, but their work ethic has been outstanding. I think Daniel is excited about the amount of time they got together during the summer on their own. So it looked -- I mean, they really, you can tell they look very comfortable with Daniel, and Daniel is very comfortable with them. Q. I know that you and I have spoken about Daniel a lot, but you've worked with so many different quarterbacks, so many different calibers and talents and whatnot. What can you say about working with Daniel Jones? And with all of the work that you've had with quarterbacks around this country that have had a lot of success, where does he stand out and kind of stack up in your opinion with all of the work that you've done? 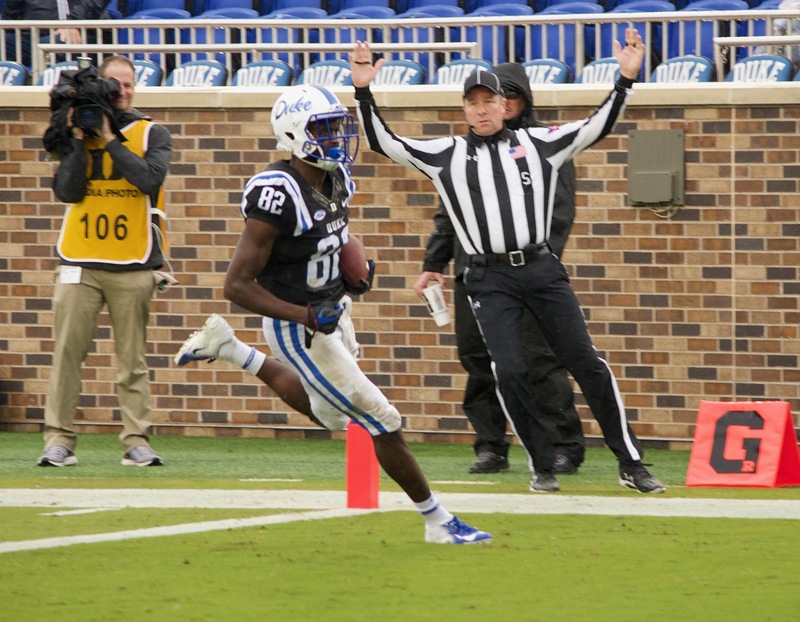 DAVID CUTCLIFFE: Well, the physical parts of it, he is really physically gifted. He's got a big arm. He's got great brains, he's got a great touch. His accuracy is really, really good. I think he's learning at a rate that most of our guys have learned. It's been fun to have him two years as a starter. It's not an accident. He's had some really big wins. He's played hurt. He's tough. He is a very smart young man. I think his football IQ is really growing. As he's played more, he really understands some of the things you've got to do to be successful consistently. And then one of the things that I think you always look for in your quarterbacks and as a third-year starter, he certainly has taken charge. He is much more demonstrative, and he knows how to run our offense, but he also knows what to expect from his teammates, and I think we'll benefit from that this fall. Q. What's your assessment of your run defense heading into that game against the Army rushing attack? DAVID CUTCLIFFE: Well, that one is so different. A year ago, we did a solid job against them. We held them scoreless the second half. They only scored 14 points on us. I think we're better than we've been up front physically. We've got very veteran linebackers, but it doesn't make it any easier. They've got a new quarterback that probably will throw it a little more. They've got their fullbacks back, which makes it -- that's where all option attacks start, and in my opinion, they do the best job of all the option teams attacking you with their fullback and with their quarterback. So they minimize their mistakes. So when you get right down to it, what you just said is the most critical question: Can we defend them? We can't count on getting any gifts from them, but can we be physical, defeat blocks and make tackles? We'll know more about that after Friday night, but I think we are more equipped than we've been. Q. I know you've talked in the off-season about your confidence in both the offensive and defensive lines being better this year for you. How have you seen both of them progress through the fall, now that the season is ready to start? 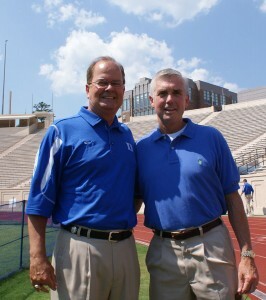 DAVID CUTCLIFFE: Yeah, I've had good conversations with Ben Albert and Jim Bridge as we've competed with each other. I've gone to a lot of those drills, and we've spent a lot of time against each other, a lot of inside drill work, a lot of broken-down live work, where it's full speed pass rush but one-on-one, full speed run blocking half line. It's been fun because it's been a war. We are more physically physical. We're stronger, and it very much shows. Our strength staff has done a great job. We made an emphasis -- we went to a four-day lift week, and we did it through our entire cycle, and in trying to become more physical. We play in such a physical league. I'm anxious -- it's hard to tell when you evaluate it against each other, but it certainly looks and feels more physical, and I'm hoping that is true when we get on the field with Army Friday night. Q. Daniel Jones is already getting a lot of talk about a potential round 1 guy if he comes out in the draft this year. What do you see of his ability to shut that noise out and kind of focus on the task at hand? 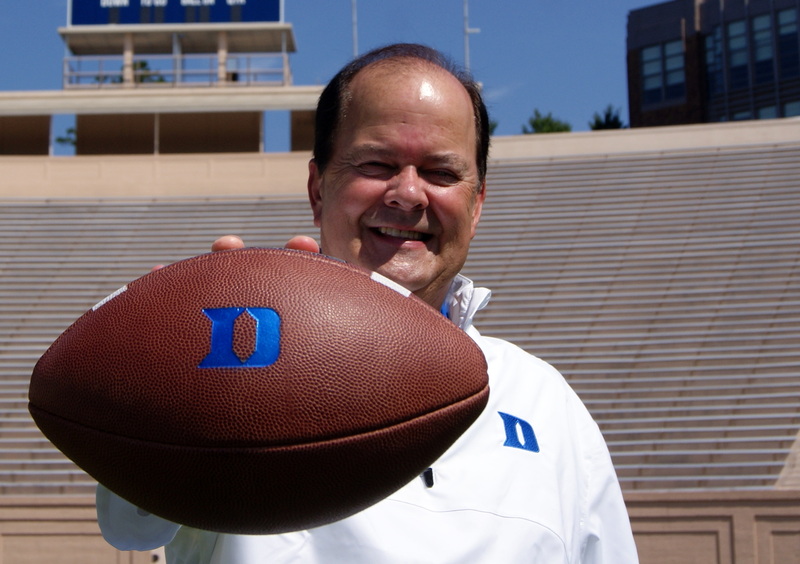 DAVID CUTCLIFFE: Well, he's an unusual young man. I promise you, he doesn't hear any noise. He is so tuned in to being a teammate. Daniel has never really been about himself. Every bit of his being is about being a part of the team. And that's really our program. We've got other guys that are underclassmen that that may well happen. If it does, I've been around it a lot before. We'll help them make what is the best decision for them. But we don't have to worry about that for a while. The fastest way to make that not happen is to be distracted, and so I think he has been tremendous this spring. Another thing I would tell young players all over this country, if you play this game trying to keep from getting hurt, you're going to get hurt. I've seen it too many years. I've done it a long time. We've met about it with all of these guys, or I did, met with them back in May after spring practice, and we feel great about where we are with that. Q. You're the elder statesman of the conference, and I hope this doesn't happen for a while, but when you finally hang up that whistle for the last time, in one sentence, what would you like your legacy to be as a person and as a coach? DAVID CUTCLIFFE: Well, I would hope that maybe if there's one sentence, it would just be that he did things the right way. I don't know that you have to kind of get beyond that, but that's what we've tried to do, and that we've cared about people. I think probably through the years, what I would -- the other part of it is trying to raise young coaches because they're going to affect a lot of folks; boy, he had a lot of good people work for him, and that is important to me as a legacy. Unless you have been in hibernation or are not a sports fan, you know that Tennessee recently fumbled the handing of hiring or firing Greg Schiano. Okay, maybe he was neither hired nor fired but let me add for emphasis that it was a hot mess. 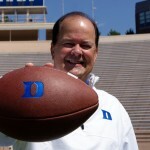 Now, sources say they reached out to David Cutcliffe who has already balked at the opportunity in the past. Make no mistake about it, part of Cutcliffes heart is in Tennessee where he met his wife. Anyhow the story is making the rounds on ESPN. 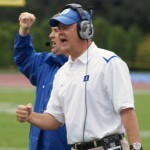 But Cutcliffe seems likely to end his coaching career at Duke. He has invested a lot of time in building a program that will soon get its fifth bowl invitation in six years. And the university has invested in him with facilities in a mutual plan for improvement. FWIW, Tennessee is now flying a group to Stillwater, Oklahoma to entertain Mike Gundy. Duke will know where they are going bowling this coming weekend. As for Tennessee, a storied program continues to struggle in their efforts to rebuild. 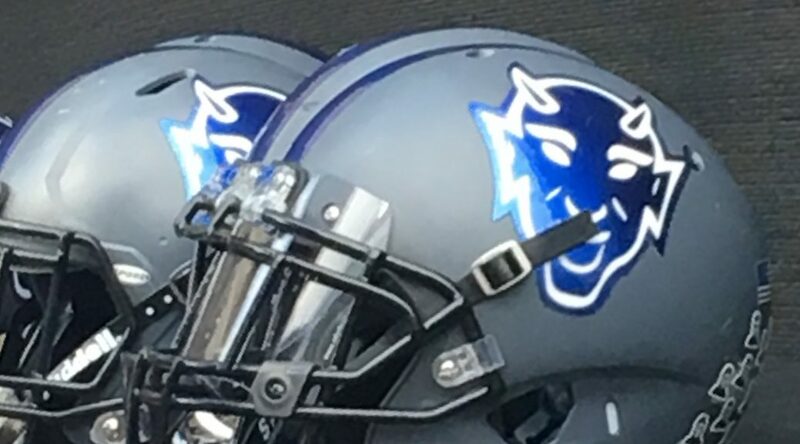 WINSTON-SALEM - The Blue Devils are headed to the postseason after securing a 31-23 win over Wake Forest on Saturday. 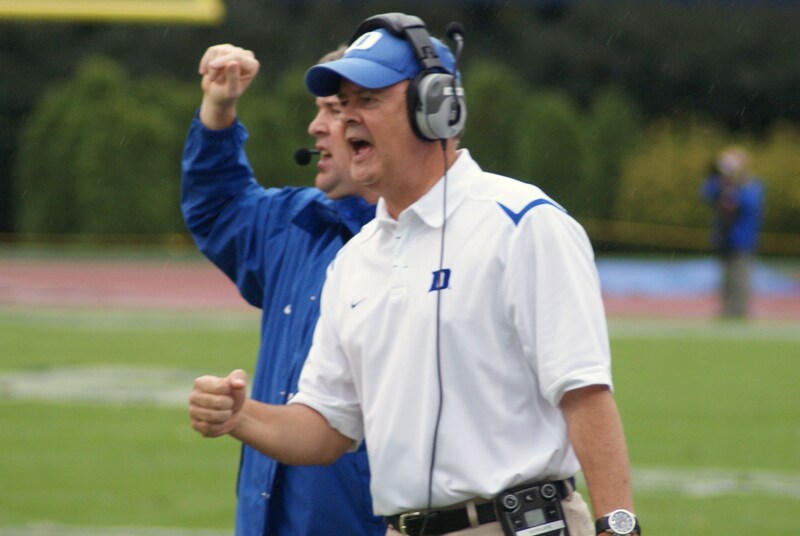 Head Coach David Cutcliffe: After falling down 14-3, the Blue Devils fought back to claim the victory and bowl eligibility, something he called "critical" for the program. QB Daniel Jones: 25-44, 346 yards passing, 2 touchdowns, 3 interceptions. 37 yards rushing, 1 touchdown. Center Austin Davis: the senior anchor to Duke's offensive line will get to play one more game as a Blue Devil.